Telepresence robots are now firmly in the mainstream. We have all seen the videos of roving robots wandering the halls of major corporations or, more comically, stuck in elevators. 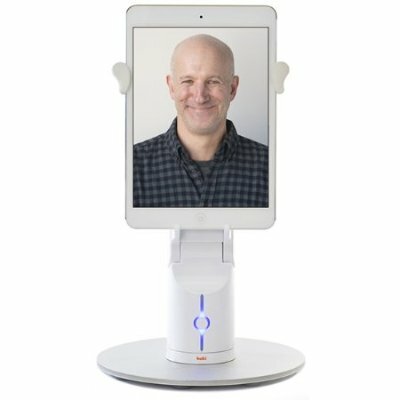 Even more exciting, people are now being introduced to a new class of affordable tabletop telepresence robots that are making waves beyond the boardroom. These products are making a huge impact in the education space, improving student outcomes, extending the reach of teachers beyond the physical classroom, offering new tools for psychologists and trainers and quickly becoming an important tool for all ages and levels. This process is only going to speed up as the tech becomes more affordable. The cost of telepresence robots has dropped significantly in recent years - from over $15,000 to $8000 to $3000 and now below $1,000. These more cost-effective machines are drastically improving a difficult problem for schools - hundreds of thousands of people fall behind or drop out of school each year for unavoidable reasons. 1 in 285 children in the U.S. will be diagnosed with cancer before the age of 20. In more granular terms, 1200 children are diagnosed with cancer each year in Texas alone. Many of these students miss weeks or even months of classes because they need to travel to hospitals out of state. Thanks to these new, affordable telepresence robots, real-life students across the country are working through this issue, attending classes when they wouldn’t be able to before. A student receiving chemotherapy in Philadelphia can continue to attend their classes in Round Rock, Texas, or a child with mono can stay up to date on their coursework from their bedroom down the street. The same is true for the 17 percent of American youth deemed by the CDC not to be in good health. For example, psychologists are observing special-ed classes in rural Utah, looking around the class and helping teachers achieve better outcomes for autistic kids. Likewise, in rural Ohio, therapists are observing interactions between autistic pre-K kids and their parents to help improve their entry into school and beyond. In both of these instances, the additional intimacy and interaction which robotics provide is critical. Telepresence robots build on established distance learning methods like standard video conferencing systems with large displays and take them a step further. These systems are extremely important in rural areas, where subjects like American Sign Language or AP Latin cannot be taught at every school. Traditional video conferencing grants access to teach on a screen that can remotely teach these subjects, but telepresence robotics allows the student to exhibit “discernable attention” and be recognized by the class as a true remote participant. We can now bring STEM experts into schools to give engaging classes in which the class visitor can literally look around and address students individually, instead of from a flat display. In higher education, universities are utilizing “hybrid learning,” a concept pioneered for graduate classes at the School of Education at Michigan State University. In these settings, telepresence robots allow students to collaborate in person and remotely, literally inventing new ways of learning. Oral Roberts University has gone so far as to offer international students to enroll without VISAs. Their vision is to open their campus to everyone in the world. Much like speakerphones several decades ago, and video conferencing in the past 10-15 years, telepresence robots are fundamentally changing the educational landscape. This technology increases engagement, for both the remote and local participants. Visiting a class, you can look around and address classmates and the teacher, instead of being a disembodied voice or an image in a square in a display on the wall. And if you want to help the US students who are not in good health, tell your local school - or just start a fundraising campaign at Wish.org or DonorChoose.org to get them a telepresence robot. Jeff Goldsmith, VP of Marketing at Revolve Robotics, is a marketing executive focusing on purpose driven technology. He has created advertising campaigns for a wide range of clients, and has written for Wired, Details, and Conde Nast Traveler among other publications.